Gigayacht ("giga" literally means billion) is the title given to the next generation of yachts that will be larger, although not by a factor of 1,000, than the mere megayachts ("mega" means million) already afloat. For a while, Everest, a 656 foot-long gigayacht named after the world's tallest peak, was said to be under construction. Also called the Double Century (656 feet equals 200 meters), this gigayacht (above) was said to have nine decks serviced by two elevators, a submarine, two helipads and hangars, indoor and outdoor swimming pools, a cinema, a library, and a scuba center. And to protect the 34 guests in 17 luxury suites, each with a private terrace, against terrorists attacking from the air or Somali pirates attacking from skiffs, there was talk of equipping this yacht with deck-launched torpedoes and Ship-to-Air Missiles (SAM). What would this gigayacht cost? $770 million to build. The cost to operate it, including the salaries and expenses for a crew of eighty, fuel, maintenance, insurance, 'marina,' not to mention torpedoes and missiles, was expected to top $70 million per year. What happened to Everest / Double Century? In 2014, a Florida-based yacht broker claimed that its owner had decided to build a 728 foot-long yacht instead, fearing that a mere 656 footer would be too easy to surpass in the accelerating gigayacht race. Named Triple Deuce (728 feet equals 222 meters), this monster gigayacht, which would cost over $1 billion to build, was said to be under construction at an undisclosed shipyard. What will be long enough? The top chart shows the gigayacht race closing in on the length of RMS Titanic. 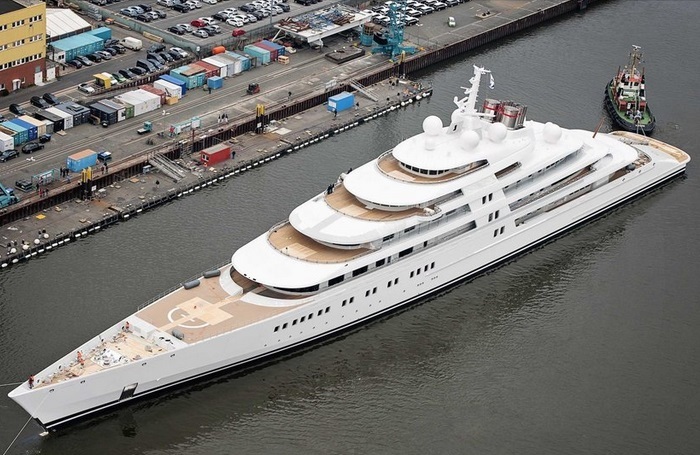 For now, the yacht to beat remains Khalifa bin Zayed Al Nahyan's Azzam (below), which at 591 feet (180 meters) is longer than Roman Abramovich's Eclipse (533 feet / 163 meters), as well as the	Dubai and Pelorus shown in the chart. Triple Deuce would almost halve the current 291 foot gap between Azzam and Titanic. 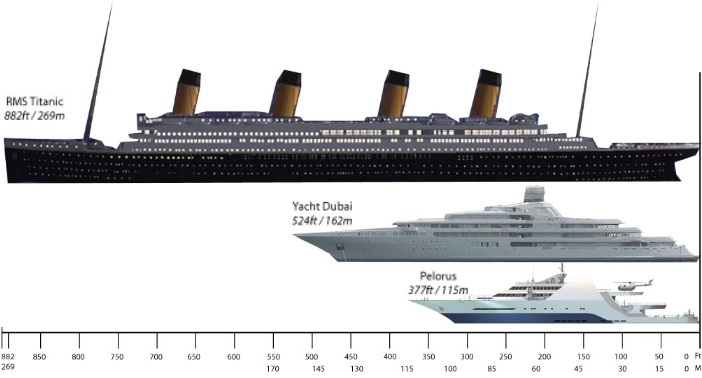 When a future mother-of-all gigayachts reaches the length of the Titanic, which was 882 feet (269 meters) long and built to carry 3,517 passengers, will the gigayacht race finally end? 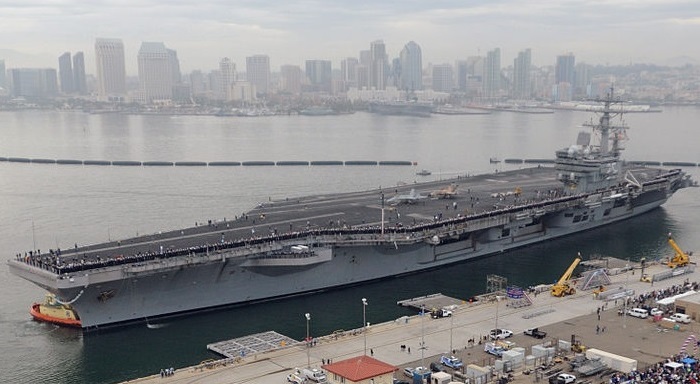 Or will it end when a future "terayacht" reaches 1,092 feet (333 meters), the length of a Nimitz-class aircraft carrier (below), home to over 5,000 non-billionaires?